On July 4th I asked America to consider taking it to the streets in honor of all those around the world expressing themselves in this, the summer of our global discontent. 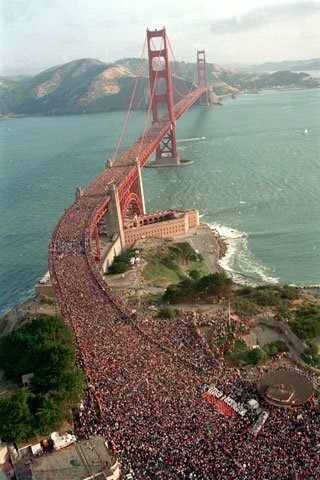 Many have thanks to the ruling that George Zimmerman acted in self-defense when he shot Trayvon Martin (though not as many as this photo which was passed around the net as a shot of pro-Trayvon marchers would suggest; this is from a 1987 celebration of the Golden Gate Bridge’s 50th birthday). Tens-of-thousands have rallied to express their moral outrage and demand Justice be served. I am glad they are out. The Trayvon Martin murder is a tragedy. And one that speaks to much larger issues with the American judicial system, morality and the fact that the institution of Justice is hardly blind, and certainly not color blind, in one of the globe’s most fundamentally democratic nations/police states/globocop. That said, the verdict is not is a contradiction of American judicial process. Whether or not the ruling was fair, it was correct. Justice, in all its current legal perversion, has indeed been legally served. In as much as it has, it has been fascinating to watch the Left employing the propagandist tools I usually leave to the talk-radio American Right as it stokes the fires and calls for mob justice. To be clear, I don’t totally disagree with the far Left. I don’t think this was in anyway Right. Or Just. But it was due process. The process itself may need a good hard look. After all, if we consider legal frameworks are established by governments, governments seek to preserve their own power, the American one is/was dominated by rich men in curly powdered wigs… are we surprised that, intentional or not, there is a racist undertone/bias? While Martin did not seek to justify his actions on Stand Your Ground, the media has consistently, and I believe rightly, referenced the law in relation to the case because is highlights the tragedy beyond Trayvon Martin’s murder – – the rising tide of right-wing legislation as the conservative half of America seeks to secure shrinking ground in a losing demographic battle. These laws, legalizing vigilantism, the right to carry (almost passé it is so common these days) and Stand Your Ground, are surrounded by a rather violent rhetoric that has already cost the lives of several liberal politicians; finding company with voter disenfranchisement acts that target minorities and anyone else who might vote for the Left. Trayvon is a symptom of something much uglier than one rent-a-cop who shouldn’t have had a gun in the first place using it under tragically dubious circumstances. So what’s a pissed off person to do? Take it to the streets, yes. But perhaps keep the rhetoric in check and consider doing it in the name of legal reform (I know, I know… that is not fun for placards and chanting). While out, consider a donation to people like the ACLU and Southern Poverty Law Center who can take outrage to the courts. And don’t vote for douche bags. And perhaps we could take a play from the Iceland handbook and try to crowd source legal reform as they did their constitution. If well managed, millions of minds hacking our legal code has to be better than the limited and biased human bandwidth of a few. In the end, perhaps we would end up with a legal code that reflects the will of the masses, and one to which the masses might be held more justifiably accountable.